These are my favorite kind of enchiladas to make. I made them a few years ago on the fly for a family party and everyone raved and raved about them. They're really delicious and easy to make. Pardon the ugly picture. Enchiladas are hardly the prettiest dished out food. But that's OK. It's what's on the inside that counts, right? Set a pot of water on to boil. Add chicken breasts and boil until done (about 8 minutes if not frozen). Once cooked through, remove from water and let cool. Shred the chicken and set aside. Heat olive oil in a medium saute pan. Add onion and saute until starting to soften. Stir in diced bell pepper and cook until starting to soften. Add the frozen corn, green chilies, cumin, salt and pepper and saute 3 - 4 more minutes. Stir in cooked chicken and set mixture aside. Preheat oven to 375. Take a glass casserole dish (9x13) and pour about 1/4 cup of enchilada sauce on the bottom. Swirl to coat the pan. Wrap the corn tortillas in a wet (and rung dry) paper towel and microwave for 30 seconds just to soften the tortillas (if your tortillas are fresh and easily bendable without breaking, you can skip this step). One at a time, put about 1-2 Tablespoons of the chicken mixture inside the tortilla and wrap up tightly (being sure not to break the tortilla). Place in the casserole dish and repeat until you have used all the tortillas and the filling. Pour the remaining enchilada sauce on top and layer a good amount of cheese on top as well. Bake in preheated oven for 20 minutes until the top is bubbly and browned (I like my top really crispy so I often put it under the broiler for a few minutes at the end). Top with shredded lettuce, diced tomatoes, sour cream, guacamole, cilantro and tomatillo salsa. 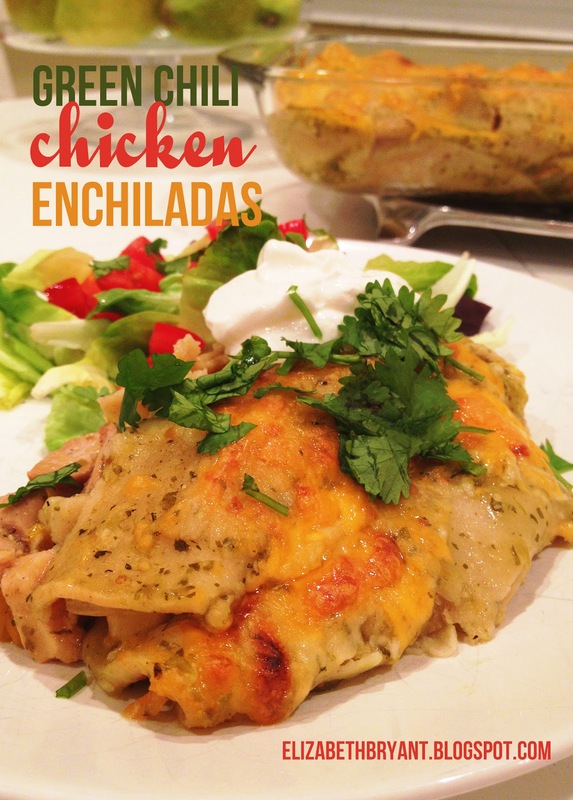 Your chicken enchilada recipe (previously posted) is one I now use regularly. Love the variation of adding green chiles to the mix! This is right up there with your cinnamon roll recipe (another one I use all the time) and the quick, easy wheat bread recipe posted a couple months ago. I ALWAYS check your recipe bank when I'm looking for something in particular, because you never disappoint! Craving meatloaf, you deliver! Thanks for all the great recipes! Thanks Ashley! I'm so glad that you are enjoying my recipe posts. :) I love blogs and Pinterest for this reason alone! I love love love your comment about the sauce. The sauce is key and there is no substitute for Las Palmas! Believe me, I have been living in the UK for going on three years now and every time I return to the US I bring back a few cans in my suitcase. It's the only sauce my dad will use, because it's the closest to his mom's homemade sauce. Also I'm glad to see you've used corn tortillas not flour, and no sign of one can of cream of anything soup in your recipe...how very un-mormon of you! Thanks for sharing! I made these for dinner last night. My family RAVED and begged for me to make more soon. And your pizza recipe is now our Sunday night family staple. I am so thankful to have found your blog. Thank you!! !